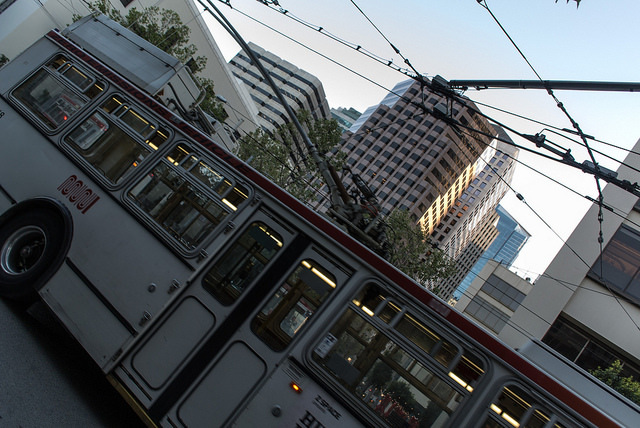 Muni rider D saw a suspicious man carrying a large empty garment bag boarding the 38-L. The whole bus went into action when they realized what he was about to do. Here’s the story. This past Monday I was on my way home during the evening commute when I noticed a guy who was acting rather suspiciously. For starters he was carrying a Macy’s garment bag and given his appearance it just didn’t match. My observation was confirmed when I saw him open the bag, which was empty, to stuff some paper and other items inside to make it appear full. When the outbound 38L pulled into the stop, the crowd of people waiting swarmed onto the bus, suspicious guy included. Having been pick-pocketed myself a number of years ago, I knew that thieves use items like that to cover their hands as they reach into open purses and back pockets. The bus was packed and I ended up standing right next to the suspicious guy. I stared at his hands and he saw that I was watching him. When I looked right up into his eyes, he moved away from me. Considering I’m about the size of a Hobbit, how could anyone be afraid of me? “Philly guy” got off the bus with his family in pursuit. Suspicious guy backed away and when I whipped out my camera, snapped a pic, he REALLY took off! “Philly guy” checked his wallet and everything was still inside. The driver came over and asked us if we were all right, and after confirming, he handed “Philly guy” some kind of Muni card to jot down information for the cops. We all got back on and started talking about how we’d all noticed how suspicious guy was acting. Once we got to “Philly guy’s” stop I got off with him and his family to try and find a cop to give a report. As we did, the driver let us know he’d radioed the incident in as well. We didn’t find a cop straight away but got SFPD’s general phone number from a security guard standing near the bus stop. I parted ways with “Philly guy” and his family and they were quite happy how things turned out. I’d like to think the positive outcome was a result of practically everyone getting involved. From our fellow passengers to the driver himself, we made a difference at least this once. What’s YOUR Muni story? Submit it, tweet it, Facebook us with your tales! On 04/11/14 at 5:30pm, the victim got on a 38L Geary bus at 25th and Geary and took a seat. Two or three stops after the suspect got on and sat next to her. The suspect got off at O’Farrell and Market Sts and at that time another passenger alerted the victim that the suspect had removed her wallet from her purse. The suspect was a black male, 35yrs, 6’, 250lbs, wearing an oversized cream colored sweatshirt.